Yes. And the initial run of the Linux-based 10,000 units have been sold out in Wal-Mart! Everex’s TC2502 gPC is the first mass-market $200 desktop PC. 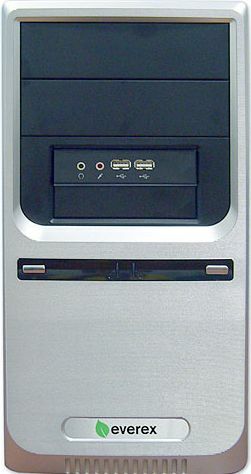 The spec of the system is very low – 1.5 GHz VIA C7 CPU embedded onto a Mini-ITX motherboard, 512MB of RAM and an 80GB hard drive – but this doesn’t matter because the system does pretty much everything that your average PC users want. It contains 10/100 Mbps ethernet and is pre-installed with OpenOffice 2.2. With the gPC you can surf the web, send and receive email, work with word processor and spreadsheet documents, chat with friends, keep a blog updated, edit photos and pictures, play DVD’s and even burn CDs thanks to the built-in CD burner. One intelligent user has installed FreeNAS and turned the gPC into a highly affordable, quiet, energy-efficient home server! He has found it compatible with FreeNAS right out of the box: all of the integrated hardware is supported, and the BIOS will boot from a thumbdrive (so you can install the FreeNAS OS on the thumbdrive). In addition, the motherboard has two SATA 150 headers, so you have very respectable hard drive upgrade options. Maybe a more relevant question is not whether Linux has found a niche, but whether Windows has outgrown the average user?